We are on Taisho Bridge. This is the 2nd bridge that crosses that Chikuma River here in our onsen town Togura-Kamiyamada. As you cross the bridge, look down. Here and there you will find teeny-tiny red stones imbedded into the surface of the bridge. The red stones refer to a legend involving the local princess. Her husband had gone off to war and hadn’t come back. So she got worried and prayed to the local god who appeared and said, “If you go down to the Chikuma River and find 100 red stones, your lover will come back.” So she went down to the river and searched as hard as she could, but no matter how long she looked, she could only find 99 red stones. She prayed to the god again, who reappeared. 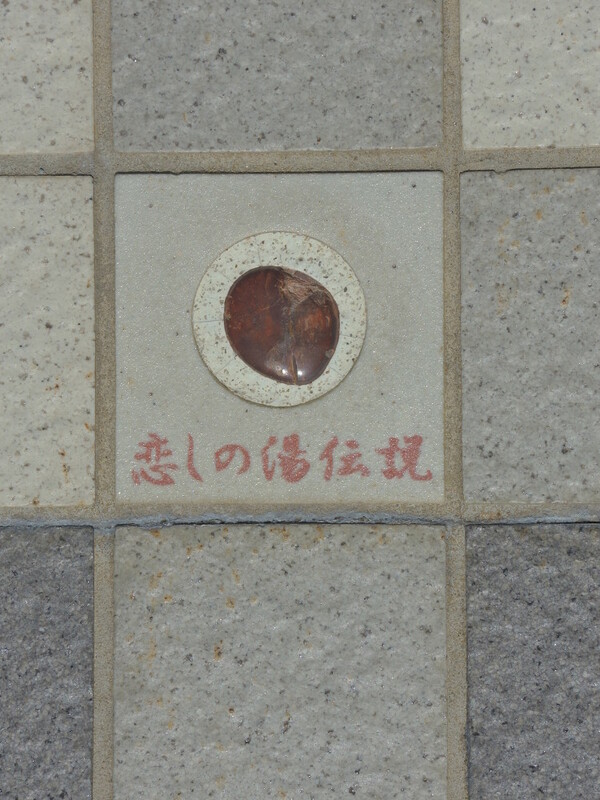 Just at the foot of where the god reappeared was the 100th red stone. So the princess picked it up, and right there is where the onsen water started to come out. That’s where Togura-Kamiyada Onsen started. So as you’re crossing the bridge, look for the 99 red stones, and if you go down to the river and find the 100th red stone, your lover will come back, too.